Recombinant fragment within Human HAI-1 aa 150-250. The exact sequence is proprietary. Human placenta, HCT116 and HeLa cell lysates; Human transitional cell bladder carcinoma tissue. Protein previously labeled as HGFA Inhibitor 1. Our Abpromise guarantee covers the use of ab189511 in the following tested applications. WB 1/10000 - 1/50000. Detects a band of approximately 58 kDa (predicted molecular weight: 58 kDa). Inhibitor of HGF activator. Also acts as an inhibitor of matriptase (ST14). This inhibitor contains two inhibitory domains. Immunohistochemical analysis of formalin/PFA-fixed paraffin-embedded human transitional cell carcinoma of bladder sections labeling HAI-1 with ab189511 at a 1/100 dilution. 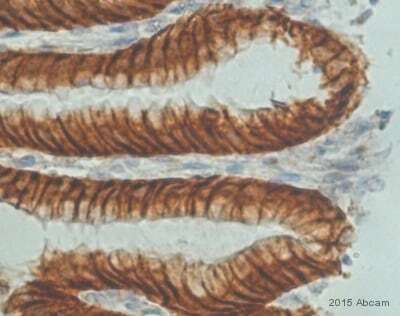 Secondary antibody used was a ready to use HRP polymer for rabbit IgG. Counterstained with hematoxylin. Publishing research using ab189511? Please let us know so that we can cite the reference in this datasheet.